The "Mad Men" season is over, but this addled fan found a way to extend it. Last week I attended a tasting held by Remy Martin Cognac at the Lambs Club. 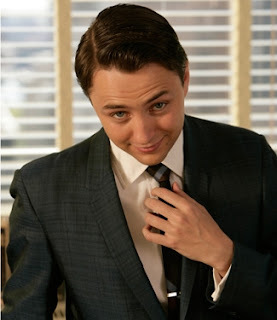 I have no idea how they managed it, but Vincent Kartheiser was there, looking very much like Pete Campbell in his slim gray suit, slicked-back hair, clean-shaven face and with a drink in hand. I introduced myself, and after assuring him that I was indeed a liquor journalist ("You do that full time?" he asked, with bright, curious eyes), I satisfied my curiosity on a few "Mad Men"-related liquor questions. First of all, I wanted to know what that whiskey was that Pete drank at home. I could never get a good look at the bottle. He was embarrassed to say he wasn't sure. "Glen-something," he hazarded. He does know, however, what Vincent Kartheiser drinks. Glenfiddich and Glenmorangie. He's a brown spirits. And sometimes vodka. About Cognac, he admitted he didn't know much, but he was getting a nice introduction that night. Remy Martin's 1738 was being mixed into some excellent Gold Rush cocktails. But he doesn't think much of Don Draper's drink of choice, Canadian Club. "Have you had it? It's not very good."